Oregon - born and raised. Timber country, majestic mountains, wild rivers, Bigfoot and The Grateful Dead! I have always been drawn to the peace and truth of Nature, as comforter, friend and teacher. Wild rivers and mountains still make my soul sing. As a child, I was highly sensitive to the deeper truths behind other peoples feelings, words and thoughts - sensing inner disharmony long before they would become aware. My scientific curiosity, rich life experiences and abiding quest for spiritual understanding have blessed me with insights and wisdom into life, the soul and the sacred. My inner Sacred Clown has allowed these journeys to be enriching rather than challenging. I draw enormous inspiration from my relationship with Spirit. Compassion, Freedom, Integrity, Fun and Honour. I am passionate about ancient Metaphysical and Alchemical Traditions, Indigenous Spirituality, Shamanism, Eco-psychology, Positive Psychology and Quantum Physics. These 'streams of knowledge and wisdom' continue to inspire me as healing and transformative forces. Holistic coach, humourous educator and spiritual seeker. I have a B.S. in Liberal Studies and am a Certified Soul Coach® trained by Denise Linn with advanced certifications in Matrix Energetics® and Psych-K®. I have additional trainings in Medicine Wheel Therapy, Australian Bush Flowers, Reiki, Rudolf Steiner Adult Education and Voice Work and other energetic healing modalities. I am also a Native Style Medicine Drum Maker and author of 'Our Essential Nature®', featured in the award winning, 'Soul Whispers: Collective Wisdom from Soul Coaches Around the World'. I was blessed to have been a core team member for World Peace and Prayer Day 2003 in Australia with Chief Arvol Looking Horse - Keeper of the Sacred White Buffalo Calf Woman Pipe Bundle and many indigenous Elders from Australia, USA, South America and New Zealand. I was told that I have walked closely with the bundle for a long time. I have been invited and participated in Ceremonies and been involved with First Nations people and issues for over 30 years. I have been honoured with several names given by Indigenous Elders. With over 35 years in small business and project management. I was in the 1991 Who's Who in the World for unique contributions to United States aviation, through my role as airport manager and air show director. I was also honoured to be in the 2011 Who's Who in Australia for unique contributions as a holistic coach and mentor. I was previously co-owner of Native Journeys, offering authentic Native American and Aboriginal arts and crafts in Australia. Australia is now my home and I am currently a member of the Foundation for Shamanic Studies, International Institute for Complementary Therapists and Society for Shamanic Practitioners. Please visit testimonials to read what others have offered. Why Sweetwater? I am not Native American, but have always led a life very close to Nature and Spirit. I have always been passionate, supportive and deeply respectful of Indigenous people, their heart of practicality, humour, wisdom and spirituality. I do not profess to be a medicine person or healer in any traditional sense. However, the wisdom of Natural world and the Ancient Ones move my Soul and guide my heart, thoughts and action in ways that I am deeply and eternally grateful. We are never alone. We are part of the Web of Life. Our ancestors, helpers and Spirit constantly walk with us in every realm. I deeply appreciate and honour those two legged dear friends, family, children, Elders and unknowns who through their words, playfulness, actions of love, and wisdom, have guided both my inner and outer life in ways I could never have imagined. Though some of you are still alive and others have passed, I acknowledge and honour your gifts always. I also learned to honour those who have 'swift kicks' or been illusory adversaries, as it intensified my quest for greater understanding through Spirit.. I honour all the 'voiceless ones' that have freely and lovingly offered their sensitive and playful teachings. May we continue to learn their language and give them voice." 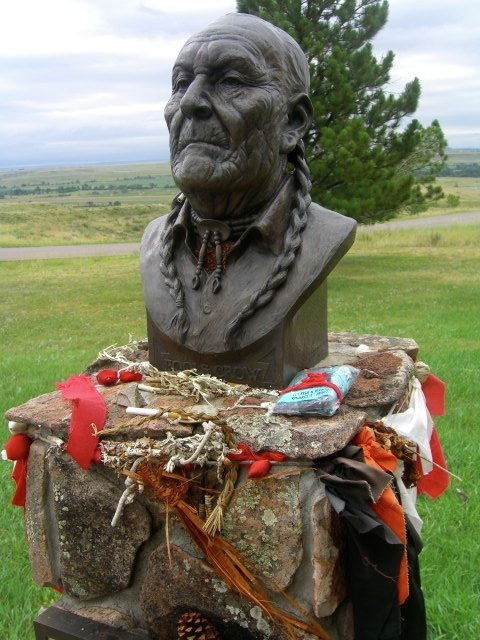 Frank Fools Crow was a deeply respected and honoured Lakota spiritual leader, a Yuwipi medicine man, teacher and the nephew of Black Elk. He spent much of his life serving his people. It was his wish to share his gifts with as many as he could reach. "We are called to become hollow bones for our people, and anyone else we can help. We are not supposed to seek power for our personal use and honor. What we bones really become is the pipeline that connects Wakan Tanka, the helpers and the community together. This tells us the direction our curing and healing work must follow, and establishes the kind of life we must live." For more information read Fools Crow: Wisdom and Power and Secret Native American Pathways by Thomas Mails and works by Ed McGaa.